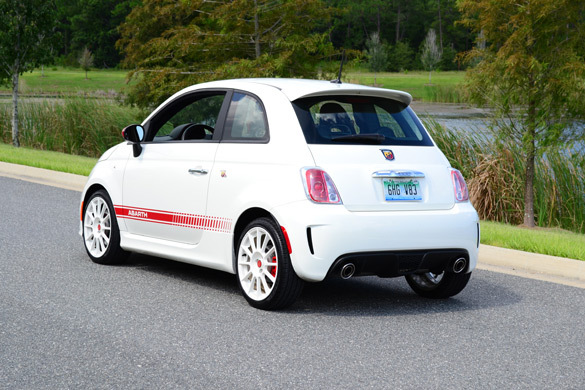 The new 2012 Fiat 500 Abarth has finally made its way to our American shores. Having had the opportunity to review the new Fiat 500 Sport and now the new performance oriented Abarth version, I can now elaborate on the stark contrast in driving characteristics and handling of the two. 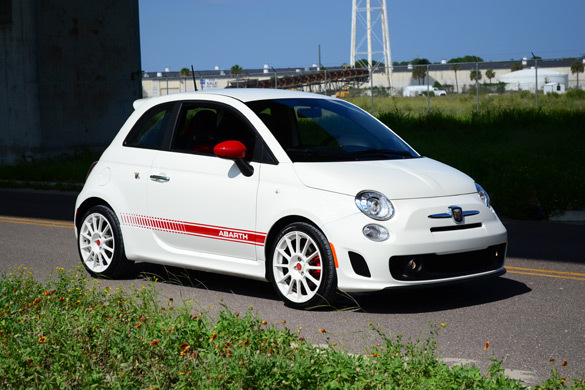 The new 2012 Fiat 500 Abarth pays homage to European enthusiasts who simply wanted long past generations of Fiat vehicles to go faster. The legendary Karl Abarth was obliged to make that happen. Abarth is not so much of a household name in America but among the enthusiast community it simply means a turbocharged 160 horsepower Fiat 500 with track-tuned sport suspension, better brakes, an ESP (electronic stability program) that can be fully disabled and up-rated exterior/interior aesthetics. 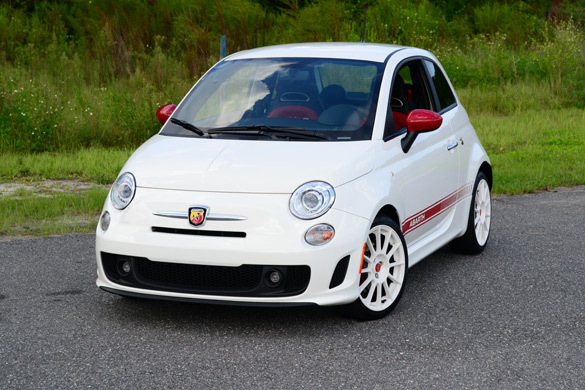 The new 2012 Fiat 500 Abarth is everything enthusiasts yearned for in the current sappy-performance Fiat 500. Now, rising from the ashes, the legend of Karl Abarth lives on in the new 2012 Fiat 500 Abarth. Having spent a good amount of time in the new Fiat Abarth and taking it to a few car shows, it was interesting to hear onlookers and inquisitive minds give me their fair share of questions about this new little pocket rocket from the Italians. 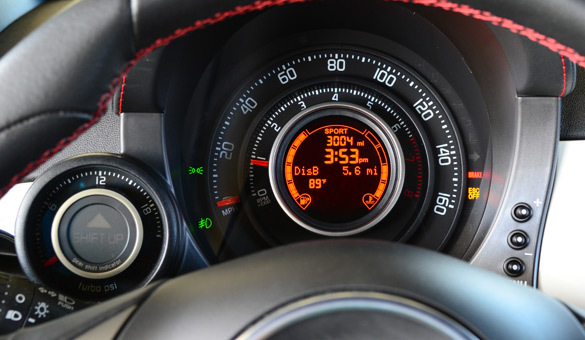 With a 1.4-liter turbocharged 4-cylinder Mulitair engine good for 160 horsepower and 170 lb-ft of torque spun through a 5-speed manual transmission to the front wheels, the 2,533 pound Fiat 500 Abarth can scoot to 60 mph in just under 7 seconds. That is about 3 second faster than the normal Fiat 500 if you are taking note. 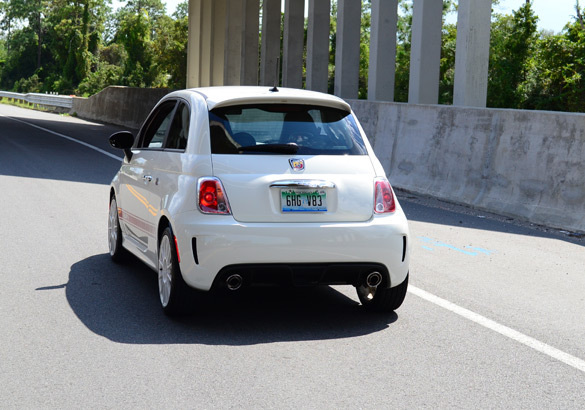 The Abarth is able to have this performance and serve up an estimated 28 mpg in the city and 34 mpg on the highway. The driving experience of the Fiat 500 Abarth is rather entertaining. The distinctive exhaust note is almost enough by itself to keep your ears at bay without turning on the surprisingly decent-sounding stereo system. The sounds coming out of the dual tipped exhaust system is surly to disturb your neighbors every time you start it up. The turbo spool is noticeable, too -especially when you are near idle. Push the Abarth to redline and slap it into the next gear, you just might get some audible feedback in the form of a faint backfire, which is absolutely cool. Of course the Fiat Abarth doesn’t give you near as much snap crackle and pop as something like the MINI Cooper S Coupe, but you will have fun exhausting copious amounts of un-spent fuel. 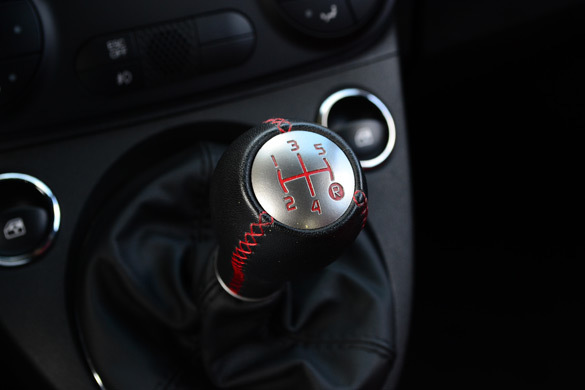 The shifter makes way for quick shifts but tends to feel much like a butter box instead of anything direct as beefed-up sports-car gear box. When I wasn’t looking at the boost gauge needle nearing 18 PSI, I was more focused on my surroundings to put the handling dynamics of the tall-looking Fiat Abarth to the test. 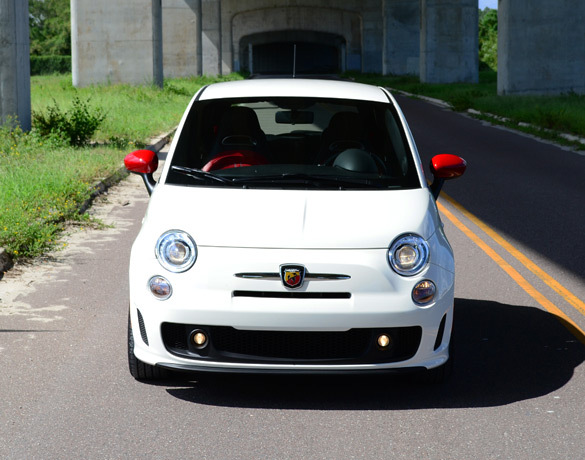 Although it looks to have a high center of gravity, the Abarth proves to be surprisingly rewarding on twisty roads. For obvious reasons, the Fiat is nimble and tends to handle well through turns thanks in part to a track-focused suspension and sitting about 15 millimeters closer to the ground than a normal Fiat 500. Not to mention, the larger but optional 17-inch painted wheels and wider 205/40-series Pirelli PZero Nero tires all add to the hot-hatch’s lateral grip. A Sport mode, set through a dashboard button, greatly improves throttle response and tightens up the steering while speeding up the steering rack at the same time. Turning traction and stability control off by holding the ESP button for a few seconds will allow you to light up the front wheels taking onlookers by surprise. Torque steer is kept to a minimum. Of course that is because the wheel-spin is managed through a Torque Transfer Control (TTC) system, which is essentially an open differential and computer-actuated front brakes to redirect torque. No mechanical limited-slip is offered. 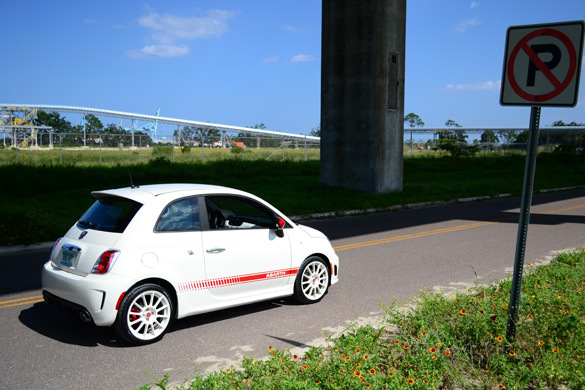 Keeping the Fiat 500 Abarth in a straight line can sometimes be a challenge when it catches grooves in the road or during heavy braking. Weight is distributed to 64% on the front axle and 36% rear, keeping it shy of being balanced driver’s car. Heavy braking, once again, is a faint reminder of the Fiat 500 Abarth’s short 90-inch wheelbase. 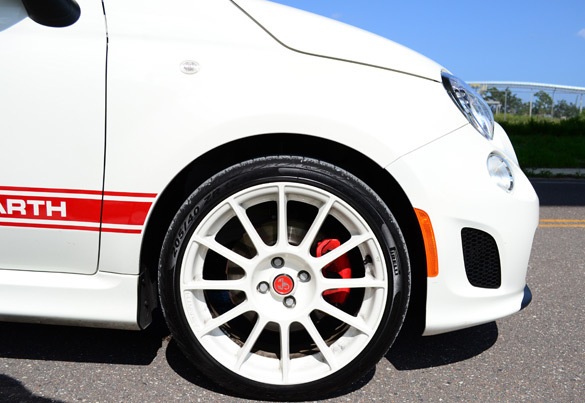 Although the brakes are larger in the Abarth than a normal Fiat 500, the vehicle tends to have an elusive sway in different directions when ABS starts to kick in. Stopping distances have been recorded at 123 feet from 60 mph, slightly more than the Mini Cooper S’ 115 feet. 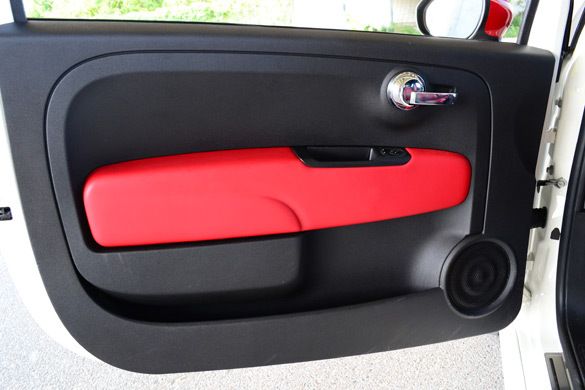 Inside of the new Fiat 500 Abarth is an interior layout familiar to that of the normal 500. 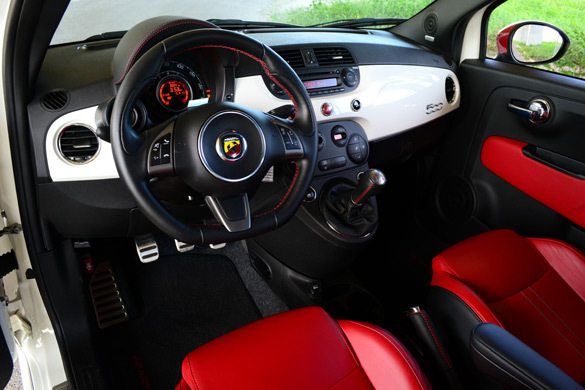 Where the Abarth version takes a different approach is the thick leather-wrapped flat-bottom steering wheel and sportier seats. 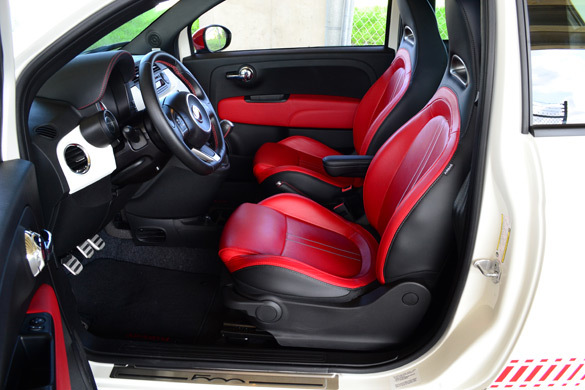 The front seats, although a different variation than ones on the Fiat 500, lack the proper bolstering to match the Abarth’s handling abilities. Moreover, finding a good seating position takes an act of congress somewhat due to the steering wheel being slightly off-centered from the driver’s seating perspective. The console shifter is somewhat of a reach with it being mounted on the console. Never mind the buttery feeling of the shifter, the large size alone will feel like you are adjusting the throttle on the Titanic. 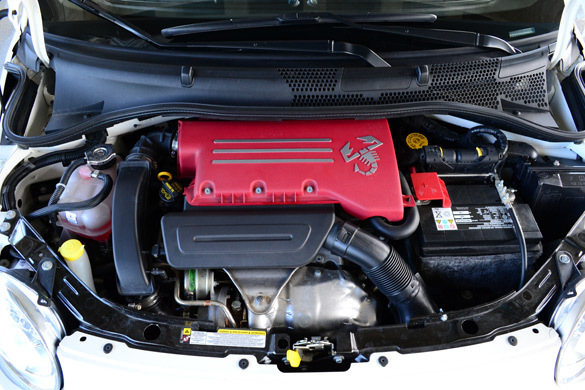 The Fiat Abarth comes with a host of standard features that you would expect from vehicles costing well under $20,000. Though, the starting price of the Abarth is $22,000 and can be optioned out with leather-trimmed seats, a safety and convenience package including auto-temp climate control/SiriusXM Satellite Radio/Security system, 17-inch forged painted and painted wheels and a removable/portable TomTom GPS navigation unit mounted through a top-dashboard port. With all of these options, as found on my 2012 Fiat 500 Abarth test vehicle, the price climbs to $26,200 including a $700 destination charge. As a comparison, a Mini Cooper S Hatchback starts at $23,100 and can rack up a much larger bill than the Abarth when the options start piling on.